People who use Zapier usually want to make their working lives more productive. But sometimes, people leverage the service to automate aspects of their personal lives, too. It's this personal use case angle that got me thinking about how I could use Zapier to manage music and podcasts in Spotify and SoundCloud. My primary goal was to find a quick and easy way to save songs to Spotify when I think of them or when I hear them. I'm not an avid music listener, and I only use Spotify occasionally, which means I'm rarely in the Spotify app. As a result, my playlists often go untouched for months. When the time comes to use the app, usually for a dinner party or a road trip, I end up playing the same songs over and over again. It turns out there is indeed a simple, easy, and fast solution. It's shared below. While thinking about new ways to add songs to my Spotify playlists, other audio-related ideas came to mind, such as how I could solicit music suggestions from friends and automatically add them to a Spotify playlist or get alerts when a podcast I like publishes new episodes. With that audio theme in mind, here are three Zaps for exploring, saving, and organizing music and podcasts. If you're new to Zapier, all you need to know is that this automation tool can connect different apps and create workflows between them—called Zaps. You can instantly use the Zaps below and get started with a free account. Let's say you're hoping for a new season of a favorite podcast, a show that doesn't update regularly, like Serial. Or maybe you're waiting for an artist to drop a new album. Using Zapier, you can get a notification anytime an account you follow on SoundCloud uploads new content. The Zap as it's shown here uses an SMS notification, which only works in the U.S. and the U.K., though you can swap in an alert from any other app supported by Zapier, such as one from email, Slack, or Burner. This three-step Zap lets you quickly write down the name of a song and have that song saved in a Spotify playlist. In the second step of the Zap, Spotify searches for the correct song. This step is invisible, so you don't get any notice that it's happening or when it's successful. When you set up the Zap initially, however, you need to test out this step by typing in the name of a song. In the third and final step of the Zap, the song that Spotify found in its search is added to the playlist of your choice, and you must pick the playlist in advance when you create the Zap. You can't pick a new one each time you think of a song. I recommend creating a playlist called New Songs or From Zapier or even Inbox so that the next time you log into Spotify, you can see all the new songs you've saved and sort them one by one into the playlists of your choice. When you send invitations to an event and request RSVPs, you can also ask attendees for song suggestions, which you can automatically save into a curated playlist. This Zap starts with either an event management or a web form. I use the Splash event management app here as the example, but you could just as well set up a web form or survey tool of your choice if you prefer to use something more lightweight. To create this Zap, first set up your event form and be sure to include a field for a requested song suggestion. 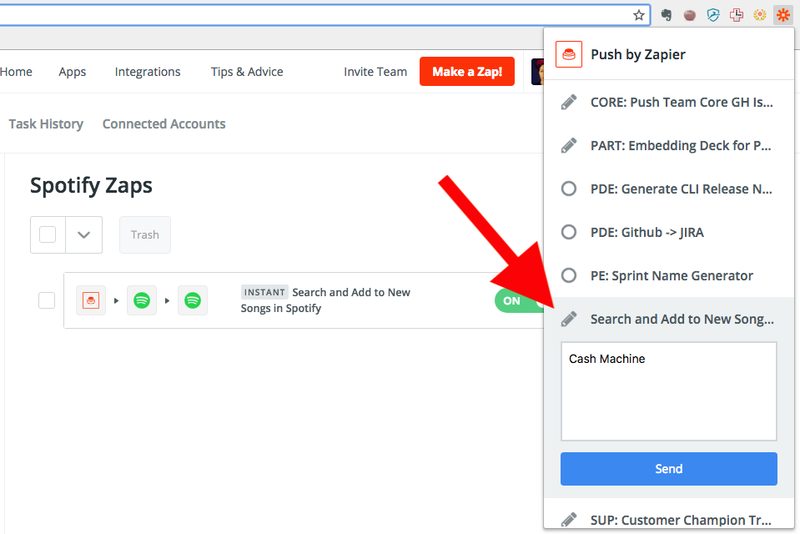 Create the Zap to pull the songs from form (step 1), search for them in Spotify (step 2), and add them to your special playlist (step 3). Be sure that the form asks attendees for only one song suggestion to keep this Zap simple. Alternatively, if you allow more than one suggestion in the field, be sure to add a Formatter step to help Spotify recognize each one separately. Look for new lists of Our Favorite Zaps every month, such as our favorite Zaps for making better use of your calendar and automatically updating your Slack status.